You've heard the hook before - the staccato eighth notes, the warm horn swells, the cry of "speech." It's the opening to Rolling Stone's number one song of 2007, Jay-Z's "Roc Boys (And The Winner Is)." But those trumpets aren't coming from some obscure 70s soul sample. Instead, Hova's production team looked a bit closer to home for the source, finding inspiration in the 45 of "Make the Road by Walking" by Brooklyn's own Menahan Street Band, one of the many projects of Thomas Brenneck, best known, perhaps, as the guitarist for the Dap-Kings, the Budos Band, and Amy Winehouse (Jay-Z wasn't the only one impressed by the track, either: a local Brooklyn principal got into contact with Brenneck after hearing "Roc Boys" on the radio, which eventually led to a elementary-school band performance of "Make the Road by Walking"). Recorded entirely in analog in his Brooklyn home, Menahan Street Band's debut LP, Make the Road by Walking, out October 14, redefines the idea of bedroom project. Released on Brenneck's own Dunham Records, a subsidiary of Daptone, the album is sonorous and warm, effortlessly enveloping itself in the Daptone funk Brenneck has helped to make flourish but also stretching itself out amiably into new territories. The album maintains a mood, of course - breezy but not banal, composed but not over-thought - but Brenneck's many influences besides soul and funk, from Ethio-jazz to rocksteady to film scores, also come through expertly and clearly. This is in musicianship and production, both of which are professionally spacious: the slight tape hiss, the vibes and sax seeping congenially into the room the other occupies - a thoroughly real and passionate approach and resulting sound; "The Contender" rides along loosely on a bouncy bass and picked guitar, everything pulling together for the hook but still leaving some answers unresolved, "Karina" layers itself nicely with thoughts of piano solos and growling horns, while the album ends with a Brooklyn cool version of Philly bravado in a cover of Rocky's "Going the Distance." Despite its studio origins, this is a band that isn't afraid to leave the bedroom every once in a while. Their debut live performance, in fact, will be as part of the Daptone Revue, the close-out show of the Central Park SummerStage 2008 series, itself a sign of all the label has accomplished. Though he called on the expertise from members of the Daptone family (and extended family), including Homer Steinweiss, Dave Guy, and Leon Michels, Brenneck himself played many of the instruments when the rest of the band wasn't around. What comes out is a fully-realized depiction of his life in Brooklyn, on Menahan Street: vibrant, exciting, and of course, very soulful. The Menahan Street Band is a collaboration of musicians from Sharon Jones & the Dap-Kings (Dave Guy, Homer Steinweiss, Fernando Velez, Bosco Mann), El Michels Affair (Leon Michels, Toby Pazner), Antibalas (Nick Movshon, Aaron Johnson) and the Budos Band (Mike Deller, Daniel Foder), brought together by musician/producer Thomas Brenneck (Sharon Jones & the Dap-Kings, Budos Band, Amy Winehouse) to record hits in the bedroom of his Menahan St. apartment in Bushwick, Brooklyn. With influences reaching beyond the funk/soul/afrobeat architecture of their other projects into the more ethereal realms of Curtis Mayfield and Mulatu Astatke, the Menahan Street Band creates a unique new instrumental soul sound that is as raw as it is lush. 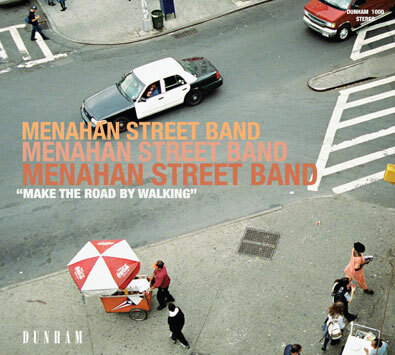 Their debut album, Make the Road by Walking will be released on Dunham Records, Brenneck's new imprint of Daptone Records, a joint venture devoted to bringing the Menahan Street sound from Brenneck's bedroom out into the world. The album is marked by eerily quirky arrangements, featuring vibes, horns, piano, organ, percussion and even a strange bling sound that Brenneck creates by tuning and plucking the strings of his guitar on the wrong side of the bridge. However, it is not the textures themselves that make the new sound of Menahan Street so exciting, but rather the way the sounds are incorporated into the heavy rhythms and bold melodies of the compositions. The title of the album was inspired both by the eponymous community center below Brenneck's apartment and the natural rhythm that has continued to move this project forward. Shortly after its release as Dunham's debut 45rpm single, the song "Make the Road by Walking" was sampled by fellow Brooklynite Jay-Z for his smash hit from American Gangster, "Roc Boys (and the Winner is…)" (later declared by Rolling Stone to be the No. 1 single of 2007). A few months after the release of the Jay-Z track, Brenneck was contacted by the principal of Public School 20, an elementary school in nearby Clinton Hill, Brooklyn, who had tracked down the original after being blown away by the sample in the radio hit. The school band invited the Menahan Street Band to their recital to watch them perform their own rendition of "Make the Road by Walking" and to join them in their music class the following Friday. The experience proved mutually inspiring for both the children and the band, and completed the songs poetic journey from the local community center through the national hip-hop airwaves, and back to the children of Brooklyn. There must be something in the water in Brooklyn these days that has kept this family of musicians going. Amy Winehouse, Mark Ronson, Kanye West, Ghostface Killah, The Hitmen, Wu-Tang Clan, Al Green, Nas, and now Jay-Z all coming to the same bunch of guys in their homemade studios in Brooklyn to get the stuff that today's biggest records are made of. However, this is far from a pop record. Make the Road by Walking is a soulful exploration by a talented young group of musicians into the possibilities of instrumental music; an original, personal, and uncompromised creation that embodies the sound of a select group of musicians in one distinct place, at one particular moment in time. "This album is kind of a window into our world on Menahan Street," says Brenneck. "In a way, we're simply the street's unofficial house band."